This comprehensive E-course will assist you with opening your telepathic abilities and communicating with star beings. Jacquelin shares some of her experiences with star beings and also shares what she has learned through a lifetime of communications with them. This course will expand your consciousness and help you to remember that you are a cosmic citizen! – You will learn about telepathy and how to enhance your telepathic skills. – Guided heart-opening exercise for telepathic connection. – You will learn about star beings and who they are. – Jacquelin shares her experiences of being hybrid and about what she has learned as a star being and from interacting with star beings throughout her life. – She shares some extraordinary experiences during a two-week period of being off-and-on star ships and interacting with star beings in 2013. – You will learn how to send and receive telepathically with star beings. – Jacquelin shares messages from the star beings. – In a guided meditation, you will experience communicating with a star being telepathically. – Four Light Language transmissions from star beings to activate you for opening telepathically, including a channeled activation symbol. – You will receive an MP3 of “Communication with Star Beings” from Jacquelin’s 2-part CD, including a guided meditation to practice communications with star beings. Part 1 of the CD goes over who star beings are. – You will receive a PDF with step-by-step instructions on how to communicate with a star being. The telepathic training this course provides can also apply to telepathy with animals, plants, and even other people. This is a very important skill to be aware of and improve on. IMPORTANT DOWNLOADING NOTE (Read after purchase): After purchasing, you will receive a link to download this E-Course as a compressed .ZIP file, which has all course files packed together. You will need to unzip (or “unpack”) these files onto your device to open them (MOBILE DEVICES need at least 125MB of available space for all files). Most newer devices/operating systems include software to do this easily. For more information on unzipping compressed files (for Windows, Mac, iPhone, or Android), see THIS simple How To article. 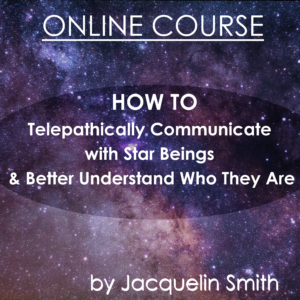 You can delve deeper into communicating with star beings by working with Jacquelin individually. You get to tailor your own program specific to your goals. You will have the opportunity to practice sending and receiving messages with star beings with Jacquelin’s guidance. Sign up for the Apprenticeship Program for Communicating with Star Beings. **APPRENTICESHIP DISCOUNT AVAILABLE** If you have taken this E-course and sign up for the Apprenticeship Program for Communicating with Star Beings within 3 months of your purchase date, you’ll receive a 5% discount for the Apprenticeship Program.